Newcastle United takeover talk has intensified in recent days after Mike Ashley's announcement that a potential sale was at 'more progessed stage' than ever before. 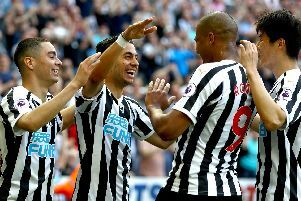 A number of interested parties have been linked with a £300m bid for the Magpies, including US billionaire Arthur Blank, Turkish businessman Murat Ulker and a number of consortiums over the Atlantic. Blank, owner of MLS side Atlanta United, confirmed he wasn't interested while rumours that a private plane of potential investors was due to land at Newcastle Airport were also rubbished. Wednesday brought the news that FOUR potential suitors were interested in purchasing the Magpies with reports that former Manchester United and Chelsea chief executive Peter Kenyon, along with a group of US investors, was the front runner. To help break down the several different reports floating about, we've produced an up-to-date round-up on how the story is being reported by the main news outlets. Despite understanding Kenyon had been given access to view Newcastle's accounts, the Daily Mail are reporting that Ashley is unsure whether the ex-Chelsea chief executive possesses the funds to complete a takeover. After the story made its way around social media late on Wednesday evening, Craig Hope tweeted: "I see some outlets have followed this up as “Ashley doesn’t believe” Kenyon has the money. I don’t think it’s that at all. "It’s more he doesn’t yet know. Ashley must have confidence he can get/does have backing to go this far in takeover talks. Kenyon is certainly credible." The Daily Telegraph were one of the first to break the news that Kenyon is supposedly the leading consortium, and sided with Hope in also stating Kenyon has not provided evidence that he possesses the relevant funds. They've also said they believe at least two other bidders have proven they are serious about buying the club and both are keen to maintain secrecy in order to get the deal one. "Ashley knows there is at least one other person who has got the money and Kenyon remains ahead of him at this stage so it can’t be that much of a problem. This is all part of the game I’m afraid." Like both Hope and Edwards, The Times also believe Kenyon is leading the race to take Newcastle off Mike Ashley's hands. George Caulkin admitted when Kenyon first announce his intention to lodge a bid for the club in September, the funds were not in place. Replying to an angry fan accusing Hope of "never writing a positive about Newcastle", Caulkin said: "Kenyon has spent the last few months/weeks looking for investors. "Back in September, when he first appeared, the money wasn’t there. I think the next few days will be crucial. As I said yesterday, it’s 100% right to be cynical. "Kenyon is brokering a deal. It’s not his money and he’s been attempting to drum up investment." BBC sports news correspondent Richard Conway is sceptical that a deal can be done in time for the January transfer window, despite Ashley's claims. The Newcastle owner said in his interview that 'I’d like it to be before the January transfer window' when asked about possible timeframes. However, Conway said: "Kenyon's group are short on time if the purchase is to be made prior to the start of the January transfer window. "Premier League checks and processes when clubs change hands take around 14 days to complete. "The Christmas break and Richard Scudamore's departure as executive chairman of the league later this month could also be complicating factors regarding that timeframe. "Those regulatory checks can only take place after extensive due diligence of the club's financial position, and any final negotiations and legal work has concluded between the two sides. "That makes a December purchase date optimistic - even if a deal was to be agreed in the coming days."